In July I spent (again) a week on Kebnekaise area, this time combining two trips into a one-week tour. Both were traverses of a sort, the first including a traverse of the Kebnekaise summits and the second traversing the whole massif with packrafts. This post is about the latter. The second part of the tour started after the third pint at the Fjällstation. The foundations of the trip being layed in the form of a pitched camp seven kilometers up to the Tarfala valley. So, fueled with the few pints me, Nina and Thomas started the walk back up to the alpine valley. With light packs it didn’t take too long. To lighten my load even further, I had left my rain gear in the camp so when the drops started to land on our shoulders, I sprinted to the camp while N and T stopped to put on their waterproofs. After a midnight dinner it was time to hit the sack. We were little worried about Thomas’ hand which was slightly swollen and clearly very sore. But with the combined wisdom of two qualified WFRs we came to conclusion that nothing was likely broken and thus it didn’t need urgent attention and some “vitamin i” would suffice. It wasn’t raining when we woke up but the rain started again while we were packing. And based on the weather forecast, it would rain heavily for the whole day. Good for the packrafting but less so for the walking. We hiked up the Tarfala valley, past the glaciers crawling down between the peaks hiding in the clouds. The end of the valley looks almost impassable but there is a decent path on the moraine ridge next to the Giebmebaktiglaciären. As we ascended up from the valley the rain crew heavier and the wind picked up. Temperature was probably closer to 0°C than +5°C and with the wind-driven rain it would be a cold day. Before the pass there was a section of steep snow and having changed our boots, crampons and iceaxes to trail runners and paddles had to make due with what we had and be carefull not to take a long tumble-down into the glacial lake. Up on the pass above 1400m it was even colder and we were soaked. I started to lose grip strength from my fingers, a typical thing for me in the cold, having to do chores by pushing my palms together instead of pinching with my fingers. I wanted to get down fast but N was starting to feel hypothermic and wanted to have a break instead. Luckily someone had cleared a small relatively spot for a tent between the rocks so we decided to have a proper break, pitched our tent and dived inside. Sheltered by the thin nylon walls, me and Thomas added a layer and N changed into her dry sleeping clothes and drysuit, which was probably the smartest thing to do. Sitting in the tent battered by rain and gusts we watched walls flap and bellow and the little streams rush through the vestibule while enjoying our hot drinks and lunch. But once the stove was off, it wasn’t too warm in the tent either so it was time to get going. Strengthened by the extra calories and layers we continued down in the steady rain through the land of snow and still partially frozen lakes. The terrain was mostly rocky but the long snow patches offered fun variation in the form of fast slides down, breaking and steering with the mid-sections of our four-piece-paddles. I’m sure the views from Guobirvaggi would’ve been great with decent weather but now we saw only the lower sections of the dark cliffs towering up towards the sky and occasional glimpse of the sharp summit of Gaskkasbakti. After wading a fast flowing glacial river fattened by the rain we got to easier ground. I ate the last bar of the day to get sensation back to my cold feet and enjoyed the easier walking as rocks started to give away for tundra. Since we started late, we reached the Kungsleden around 20:00 and had to make a decision: camp near the Kuoperjåkka shelter or hike additional 7 kilometers upstream to Sälkastugorna huts. We could see several tents near the little shed downstream and there would be soft dry beds, a little shop and even sauna at Sälkastugorna so the decision was pretty easy. We hiked up to the hut in 1 hours 40 minutes on the Kungsleden, one of the most famous trails in Scandinavia and thus very worn too. Unfortunately we weren’t fast enough to get to the sauna which was closed at 21:00 but cans of cola and warm dry beds felt about as good. When hanging our gear to dry I emptied half a cup of water from each of the chest pockets of my shell jacket. So much for waterproof zippers! Knowing that there was also a liter or two of water in our tent from the lunch break, the dry and warm bed felt especially good. After a short walk to the river we inflated our rafts, scouted the river from a nearby hill and hit the waters of Tjäktjajåkka. Now the extra 7 kilos lugged over the mountains started to do the work and pay back. The river started with a section of rocky class 2 water with a couple of bigger waves but soon calmed down into fast and straight-forward class 1 ride. At the first reindeer fence we got out and scouted the canyon-like S curve leading to a little bridge. N and Thomas decided to portage it while I paddled it without the rucksack on the bow. I’d estimate it was around class 3 due to big waves and thigh turns with a neat narrow gate in the end. Very beautiful spot along a river with great views. It was cloudy with light showers of rain but great weather compared to the day before. Paddling was easy, fast and enjoyable. Very nice packrafting indeed. The MRS Alligator 2S performed well and the dry spray deck and excellent thigh straps were worth the extra kilo. Closing into the next bridge we knew it was time to get out from the waters and portage based on the aerial photos on Lantmäteriet map service. The beginning looked like fun class 2-3 drops and waves but soon the river rushed into a deep, steep and narrow canyon suitable only for the maddest hard-shell white-water enthusiasts. We had a nice lunch break by the side and portaged along the Western shore past the waterfalls near the Sami village of Kårtjevuolle. I played around a bit in the final drops enjoying another incredibly beautiful spot. This is how rivers should look like! But soon it was time to continue downstream. At the end of the previous day we had scratched our original plan of packrafting all the way down to the Padje Kaitumjaure, then following the lake to East and bushwhacking over the fjells to Laddjujohka to paddle down to Nikkaluokta. After the long and wet day it felt like little too much. So instead we took out near the Unna Jiertas fjell and called it a day. There were many gravel banks suitable for camping and quite a bit of dry willow branches cut by the winter ice and left up to dry by the floods. This all translated into good camping grounds for packrafters. We pitched our tent, spread our gear all over the place to dry in the wind and I bolted out to gather some dry branches for a campfire. For me, an evening by a campfire is essential part of a good packrafting adventure. Unfortunately it started to rain soon and instead of a nice evening by the fire, we spent it in our tent. But the tent and our gear was mostly dry so no real reason to complain. The next morning we packed our still dripping wet rafting kit into our rucksacks and headed up to the trail towards the Kebnekaise Fjällstation. Despite the clouds, the views down to massive Tjäktavagge valley and around the alpine-like Jierttajavri lake were beautiful. The weather was the familiar mix of cloudy and windy with showers of rain but after the one very wet day, it didn’t feel too bad. Walking on the trail was pretty easy and driven by the promise of hot sauna and cold beer, we hiked the 15 kilometers in four hours or so with very few breaks. In the afternoon we were again at the Fjällstation. We hadn’t planned it that way but it was welcome. Short and easy day, good coffee and sandwiches on soft sofas and sauna with a cold beer. Not too bad. I felt I could get used to doing trips like that. But not to take it too far, we opted not to have the three-course buffet dinner and also slept in our tent instead of the soft beds. In the late evening the temperature dropped to +4°C but we were warm crammed in our cozy little tent. The Anjan 3 is better for two but works also for three as planned. Waking up to a cold but sunny dayfor an early start we got distracted by the excellent breakfast at the Fjällstation once and for all and sat there for an hour making up the calories lost during the previous days and downing several cups of good coffee. We were again dressed in our paddling gear and I’m sure many of the fellow guests would’ve liked to ask from the neoprene-clad Thomas what he was up to but politely refrained. From the distance it had seemed that with the high water we could start paddling almost straight down from the Fjällstation so we walked about a kilometer down to the river. Here the river was more like a stream but seemed paddlable, rocky and fast but not impossibly shallow, so we inflated our rafts one final time and shot down the stream. The river stayed small, shallow and fast down to the confluence of the Darfaljohka. It was difficult to avoid all the rocks but good paddling was rewarded with fast and splashy ride without getting stuck on the rocks. Down from the confluence the stream grew into milky.-coloured creek with occasional simple splashy class II sections. Simple and fun going! On the shore there is the legendary Lap Dånalds which was now closed and superseded by “Restaurang Enoks”. Judging from the upgrade, the reindeer burger business is doing well. Once again we surrendered for the temptations, walked in and offered the whole shebang: reindeer burgers, Cola, waffles and coffee. And oh boy, it was good again! From the lake the nature of the river changes: It’s more like a proper river than a creek. With this water-level it was was almost a single constant class II rapid for the final five kilometers. The riverbed was littered with boulders from the size of a bucket up to size of a big refrigerator, there was often sweepers in the outer bends and occasional thigh S curve when the milky water had found a new way through a gravel bar. We went down eddy-hopping a section at a time me leading the way. During a longer more demanding section I got worried about how N would do and tried to stop mid-stream to have a look. Instead I hit a rock and capsized. Luckily I only hit my knee and was able to self-rescue easily in the shallow water. A stupid mistake reminding me that paying attention to the river is always primary and other worries secondary. Near Nikkaluokta we arrived once again to a reindeer fence and got off from the river. This time it was not to portage around a dangerous section but for the final short walk and wade to our car which was waiting near the helipad. Six hours after launching our rafts we had paddled 19 kilometers down to Nikkaluokta. With stomachs still full of burgers and other treats we loaded the car and started the long drive South. The latter part of the trip didn’t go quite as planned but was very enjoyable, maybe except for the wet and cold first day. Should the weather been better we might have done the loop as planned but then we would’ve missed quite a bit of the paddling from Laddjujohka, which was great fun. But I guess I’ll have to return there again one day to explore the lower Tjäktajåkka and many other interesting looking rivers. There’s a lot to paddle on the area! The rivers on the Kebnekaise area are mountain rivers with some creek-like sections. The water-level can change rapidly and you need reasonable level to make good packrafting. See for example SMHI Vattenweb for simulated flow estimates. Based on the Vattenweb we had over 20 sqm/s at the put in of the Tjäktjajåkka and little less at the lower Laddjujohka. Thanks to the heavy rain, both rivers were clearly above the normal summer level. Probably half of the flow would be enough for good packrafting and more might make it challenging in places. I would recommend going earlier in the season to catch the end of the spring flood or waiting for rain to get proper flow. Anyway, one should pay attention to the planning and make sure to avoid the seriously dangerous sections (consult aerial photos for that) and if planning to do whitewater, have the proper gear, skills and company. The scenery is magnificent, the rivers are beautiful and the packrafting is fun, but remember to be careful! Packrafting at Ruunaa – Video! In mid June I was on an overnight packrafting trip at Ruunaa Hiking area known for its rapids. In my trip report I promised there would be a video later when my friend has time to put it together… And as Thomas unfortunately damaged his hand on our recent trip around Kebnekaise (more about that later in my blog) he now had the time to edit the video! More packrafting trip reports (and maybe videos from Thomas?) in the blog later. Meanwhile, enjoy the summer and remember to pick berries and mushroms for the witner! After spending nearly half of the winter skiing and hauling and sleeping on snow and ice, it was time to kick-start the summer season in mid-June. For this I headed to Northern Karelia, near the Eastern most corner of Finland where one can find almost untouched nature in the deep woods and also excellent white water paddling on several rivers. First part of the summer season kick-start was the 64 Wild hiking event organized by the Finnish outdoor clothing company Sasta who I’ve been working with developing the perfect shell clothing for demanding Arctic expeditions. Sasta hails from the deep woods and vast mires of Nurmes and wanted to show their natural habitat to their clients and other outdoor enthusiasts in the form of a three-day hiking event. My role during the weekend was partially just hanging around, partially guiding and giving a campfire seminar on the first evening. A fellow wilderness guide Anton Kalland gave an excellent campfire seminar on wild greens and other useful resources one can collect from the nature while hiking. The route plan suggested daily distances of 17km, 24km and 10km with some scenic or historically interesting waypoints along the route. In reality I ended up walking around 19km, 31km and 10km, skipping one way-point on the first day, visiting all the waypoints on the second day and cutting it a few kilometers short on the third day to catch the bus back to Nurmes with majority of the participants. A proper start for the backpacking season! The route was very nice with good views and interesting nature. But when walking in the woods I prefer shorter mileage to have more time for the details of the fine surrounding nature. My feet took quite a beating as I chosen to walk in my waterproof mountain boots instead of light hikers better suitable for long days. At least the feet are now literally “broken in” for the upcoming summer. The weekend was also quite rainy and being little lazy selecting my spot I ended up sleeping in a stream during the first nigh. Luckily my tent has a good quality bathtub floor turning a possible catastrophe into a quite comfortable although weird water-bed. It was a great event and I wish to participate again the next year. Hopefully with an option of shorter distances for more time to admire the nature and spend time by the camp fire in good company. After the hike I went to Ruunaa area at Lieksanjoki. The area is well-known for its whitewater (mainly for one excellent and easy to reach wave for playboating) and fishing. Me and two friends were after the whitewater to test our new MRS Alligator 2S packrafts. We arrived to the end of the road near Paasikoski rapid around midday, walked to the river, inflated our packrafts and got out for a little test spin. The Alligator was slightly less stable than packrafts with wider tubes but with its six-point rigging it offered tons of control and very agile boating. After feeling confident with the new boats we strapped our packs to the bow and headed down stream. Paasikoski (class 1) was very easy-going. The Haapavitja (class 2) rapid offered little more fun in the form of bigger waves and more speed and was followed by easy going river sections which ended into the Neitijärvi lake. 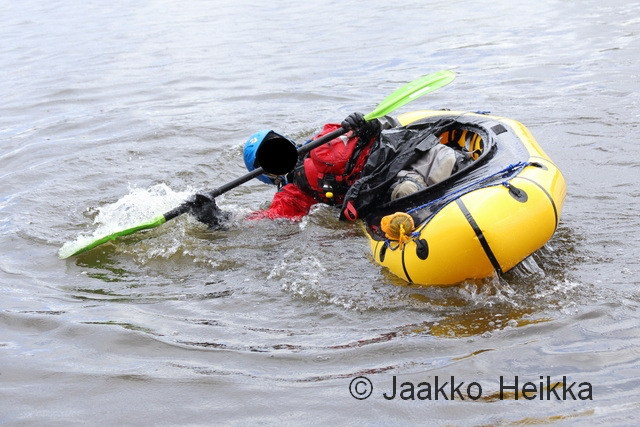 Lake paddling into headwind was hard work as always but it was soon rewarded by the Neitikoski rapid (class 2*). 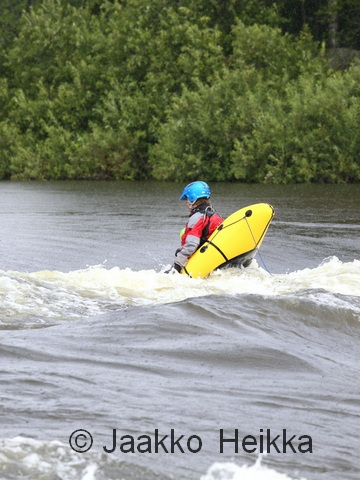 A short, narrow and deep bit with an excellent stopper wave suitable for freestyle kayaking. We had all done the rapid in the past so decided to go straight thru heading into the big wave to see how the boats would perform. I went first, capsized and took a swim. Huck followed and did the same. Thomas coming as the third decided to take the easier line on the right and stayed upright. We probably did a good impression on the kayaker playing in the wave! After routine self-rescues we went back to the shore, got rid of our packs and went testing the wave again. Huck tried to get thru the wave with the rucksack on the bow and managed on his third try but capsized in the wave train following the stopper. Me and Thomas concentrated on trying to get into the surf. Thanks to the thigh-straps of the Alligators it was possible but the current was simply too strong for our skills, or for the packraft in general, as once you got into slightly wrong angle or position the rushing water twisted our low-pressure rafts in a way that even agressive bracing didn’t help and swims were inevitable. But it was still damn fun! After an hour or so in the Neitikoski we continued down stream paddling Kattilaskoski (class 1) and Murrookoski (class 2) which we scouted for a safe route and also to get warmer as it was raining and our energies were getting low. After Siikakoski (class 1) we took out and camped at one of the many lean-tos on the area. We had a great evening by the campfire enjoying good food, beers, stories and the short night of the summer solstice with a glimpse of the full moon and falling in sleep to the sound of the rushing water. The new MRS packrafts worked really well and I’m excited to get more whitewater time with them. Packrafting is so much fun, and packrafting whitewater is even more fun! I’ll write more about the boats later this summer. Altogether it’s a 4 kg package which, in my opinion, hits the sweet spot between the whitewater performance and the packability and performance for general use. If you want to test them yourself, ask for possibility to rent one or join one of my packrafting courses! As usual, more pics here. * These are my estimates on the classic whitewater rating scale based on the water level (138,9m) and discharge (95m^3/s) we had on the trip. The official ratings are little higher, especially for higher water levels. For packrafts the big stopper wave in the Neitikoski difficult but there is a way around if you don’t like the chance of swimming it.